How do you properly construct a strong, light firewall mount? what type of wood do you use? I think firewalls are mostly made of plywood, may also be thick balsa for the sake of weight, but ply is structurally stronger. I like Birch ply. It can be bought at most craft and hobby stores. Basswood sheets, while tempting, split very easily. Material can be most anything but it has to be made correctly. It's not that hard to do, I just rebuilt my wood motor mount that I screw to the old plastic firewall. 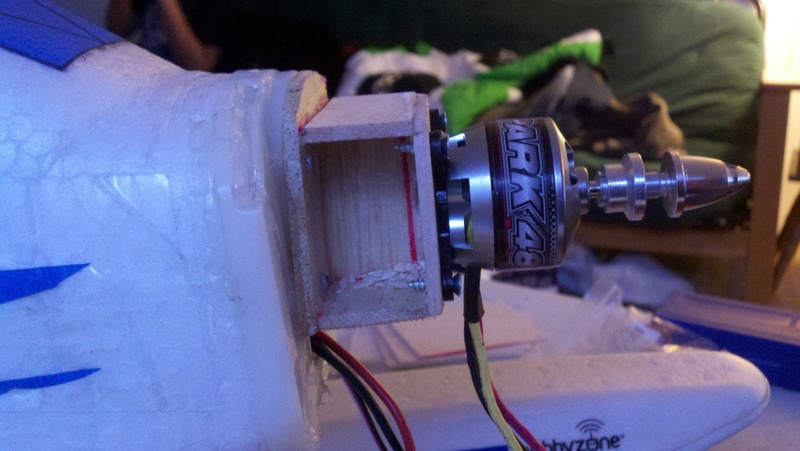 I built it in about an hour late one night so I could mount a brushless motor after I fried the original esc. I had to go float flying again the next day. I'm sure with proper tools and materials you could do a much better one in a few hours. 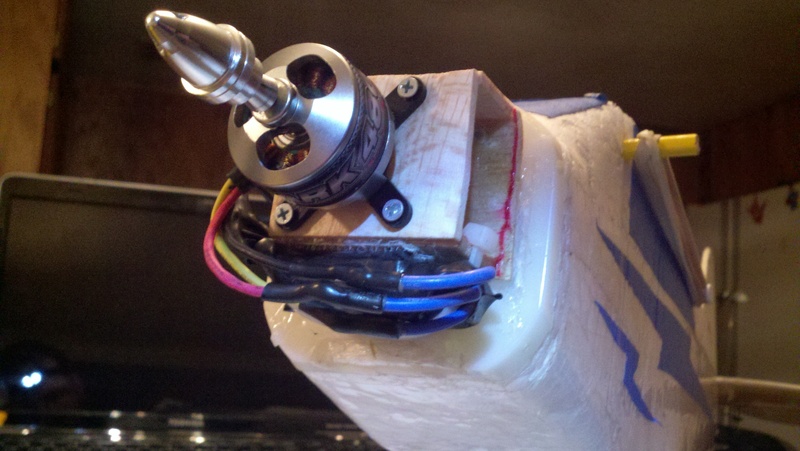 Or make it of alu - easy to adjust for right angle of the motor and easy to bend back after a hard landing. Will also protect the motor shaft somewhat. Thanks for the info everybody! I made a firewall before, but it broke on impact. Now I know why; I used basswood. I am just getting into this hobby and I am curious as to what I should use for the firewall. I have access my laser cutters here so I can build my own but I just can't seem to figure out what is the best material to use. What do the flite test guys use, plywood? What are the dimensions, i.e. thickness and ply count? The Only info I can remember from past videos is that the FT guys use 3/32" aircraft grade plywood. Not sure what type. I really would like to find some but haven't been able to get any at the LHS, they only have hobby grade plywood. I was able to get some stronger plywood at Michael's but it was a little thicker. I may have to go back to that since I can't find any. I found some birch plywood on amazon.com, link below. I will let you know how it goes. It's just 1/32 thicker than what you suggested. I just went to Michael's and found the birch plywood at the same thickness 1/8" (labeled 3mm), it's a little thicker than the FT stuff, but it's 3 layers of sandwiched ply, I've actually taken the softer outer layers and kept the inner harder layer for control horns on previous builds. I'm making landing gear brackets for my anycopter hex out of them and will see if I keep it full thickness or not. I may also wick some CA if needed for strength as well. I broke all my wood firewalls so I switched to using plastic. It's way more durable, lighter, and easier to work with. Ditto on the plastic. I use PLA and 3d print the firewalls I need. It has worked out famously so far.